Wedding cakes by David McKnight is a family run business and it is our mission to provide the perfect cake, at a low cost price but at the highest of standards. Our service is personal, stress free and straight forward. Wedding cakes by David McKnight will make that "cutting the cake" photograph a memory for a lifetime. Was this review helpful (Yes: 4, No: 0)? 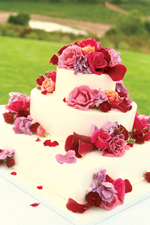 Wedding Cakes by David McKnight 5 out of 5 1 user reviews. "i need to book my wedding cake i want a 3 tier wedding cake i would like a 4 tier wedding cake"